The cover of my paperback version is a bit more tattered than this image I found (Click to embiggen). I think I found my copy of Ursula K. LeGuin’s City of Illusions at the used book store that was in a town thirty miles away from the town I lived in for most of middle school. I know that I owned it before my folks split when I was 15. I don’t recall exactly where I acquired it, but I do know why I wanted to book: the character on the front of the cover had cat’s eyes, which I thought was really cool. I don’t think this was the first sci fi novel I read that featured such a character. There are are so many sci fi books with characters that look mostly human, but have eyes like a cat or a bird of prey. But it was the eyes that really grabbed me. The story begins with the man on the cover being found in the woods without any memory, not even a language, no clothes, and no clues as to who he is. The people who find him aren’t certain he’s human, because of the eyes, but they take him in, name him Falk, and teach him. We learn that this is Earth of a distant future, once part of an interstellar federation of some sort, conquered by aliens, and now severely de-populated and isolated from the rest of interstellar society. The aliens technically rule the world, but they keep to themselves in a single massive city. Falk eventually sets out on a quest to try to discover who he is. This allows the author to show the reader other parts of the world before Falk finally is taken captive by the alien overlords who tell him he’s one of only two survivors of a crashed spaceship from another world. They introduce him to the other survivor, and offer to restore his memory—though it will mean erasing his current personality. Falk agrees, and the novel switches to the point of view of the restored personality, who doesn’t know what Falk knows about how the humans on earth are treated. The aliens want Falk to go back to his own people and tell them how they are running earth as a garden, keeping the humans happy. Eventually the original personality is able to awaken Falk’s memories, which also means that he winds up with two personalities trying to work together. I’ve left out an important detail: just about everyone seems to be telepathic, Falk, all the humans he meets, and the aliens. Telepathy was how the old Federation came to be, because no one can tell a lie in psychic communication. Except it turns out the alien invaders can. Falk and the restored original personality realize the aliens aren’t going to let him go if he remembers the truth about Earth, so he has to steal a spaceship and escape to his homeworld where he may be able to convince them to attempt to liberate Earth. There’s a cute telepathic trick that Le Guin uses at a crucial point in the climax, and the story ends on wit Falk on his way to his homeworld, but without the certainty that Earth will be liberated. The novel straddles several categories of science fiction. The world is a post-apocalyptic world, even if the apocalypse happened a thousand years ago and a new, stable set of societies have developed. There’s also the aliens subjugating humans genre. And the isolated protagonist who has to discover who he is. The novel is one of three loosely connected books (the others being Rocannon’s World and Planet of Exile) in which Le Guin was working out a single future history, in which humans have been seeded on many worlds, and they have diverged in various ways, but still consider themselves one race. This is where it encompasses another idea that was more popular in Golden Age science fiction: humans aren’t native to Earth, but were seeded there hundreds of thousands of years before our time. Some of her much more famous later books, The Left Hand of Darkness, The Dispossessed, and The Word for World is Forest are sequels, in a sense, to these books. They all allude to the common history of these three, in any case, so a lot of people lump them all (along with a few others and some short stories) into a single saga called The Hainish Cycle. Le Guin herself has rejected the label, in part simply because the collective works don’t tell a single story. Another reason is that in the first three books she was trying to figure out how to do a future history, rather than having drafted a coherent future history as a grand backstory to it all. So there are contradictions and variances in the histories of all the books. The City of Illusions is one of those stories that sticks with me in weird ways. 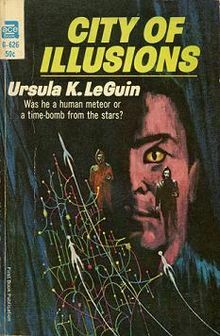 I remember Falk, his struggle to discover himself, and especially the way that Le Guin portrays the two people living inside one head phenomenon at the end. I remember the notions and paradox of telepathic lying. But I forget things like what the aliens are like. I forget what any of the other human societies that Falk visits during his adventures are like. That’s not a bad thing. The story is, on one level, about isolation and discovery. And that part really resonated for me at that age. Some of her other ideas from this book I find myself incorporating into my own stories without consciously realizing where they came from. Which I think means that Le Guin conceived them and executed them well: they’ve become part of the fabric of how I think things would actually work. Years later, I have read many other Le Guin books, and I own her translation of the Tao Te Ching, a holy book that figures in this novel’s plot. Which I think means that once I finish reading this last Hugo novel, I need to add City of Illusions to this year’s queue for a re-read.